Murfreesboro software developer Bill Meek, wife Lisa and their family started a local franchise of DoodyCalls about four years ago. 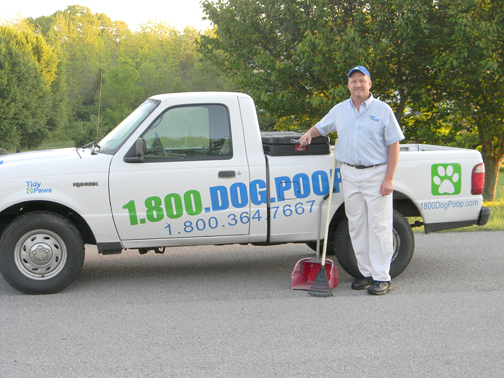 If you want to hire Tidy Paws, you call 800-DOG-POOP. After all, when you’re in the pet waste business, you can’t take yourself too seriously. Murfreesboro software developer Bill Meek and his schoolteacher wife, Lisa, started a local franchise of the national DoodyCalls company about four years ago. The idea is simple – pet owners call the companies to clean yards, for anywhere from $15 to $35 a pop, depending on how many dogs there are and how often the homeowner uses the service. Both Tidy Paws and DoodyCalls come to the house in marked vehicles, and employees are in uniform. They put on gloves and take out plastic bags, and in 15-30 minutes, the job is done. And sometimes, employees provide bonus time, like with Mary Elizabeth McClung’s golden retriever, Sport. McClung pays $15 a week for the service because she has gotten busier as her pre-teen kids get busier. Why not have the kids clean up after Sport? “They want to play with him, not clean up his poop,” McClung says, laughing. Marilynn Denn of Murfreesboro had no problems telling her kids to clean up the backyard. But her children are now grown, and Denn has retired from corporate public relations. So she now has Tidy Paws clean up after her three dogs. “I’m like, that’s it, I’m retired. I got tired of cleaning up the backyard by myself,” she says. Brad Luther, a former engineer for Whirlpool, operates Tidy Paws in Murfreesboro, which he says grosses about $170K per year. Denn says she particularly likes Tidy Paws because owner Brad Luther is flexible with scheduling and payment. Denn says he even agreed to have her wait to pay him until after her Social Security checks arrive. “I’m really pleased with Tidy Paws,” she says. It’s that kind of personal service from both companies that let them develop loyal customers as a base, a base that has grown for both DoodyCalls owner Meek and Tidy Paws owner Luther over the past four years. Meek, still a software developer, says he now has two trucks and more than $100,000 in gross annual receipts, which allows him enough net income to replace his wife’s schoolteacher salary. Luther operates four trucks and grosses around $170,000 a year. And there’s plenty of room for growth. The American Pet Products Association estimates that the pooper scooper business has potential to generate more than $2.6 billion in revenues nationwide. Meek says he started his company because he and his wife were looking to start a business. And the pooper scooper operation had low overhead, no night hours and is relatively simple to operate. Luther was an engineer at Whirlpool who saw the writing on the wall for that crumbling local operation. So Luther, who has a special needs child at home, started researching a company that he could run from home. Luther also was attracted to the simplicity of it. And both Meek and Luther started out cleaning yards themselves. Ewwwww, right? Not so much. Both Meek and Luther have kids, so dogs poop is nuthin’. “You change diapers, and they make you kinda immune to it,” Luther says. Turns out picking up dog doo isn’t the only way to make a pretty penny from poop. A Knoxville-based operation is making money by analyzing it. The company is called Poo Prints, a spin off of BioPet Labs, which launched in 2008. Poo Prints works with doggy DNA to identify pets by their waste. The practical application is that apartment and condo complexes can use Poo Prints to uncover which pet owners are violating clean-up-after-your-pet policies. Customers who hire Poo Prints have all pet owners register their animals by swabbing their pets’ cheeks and dropping them off to property management offices. Then, when there’s a pile that hasn’t been cleaned up, property managers get a small sample with a collection kit, and the sample is mailed off to Poo Prints. The company identifies the pet within five to 10 days. Um, doggie doo is put into the postal system? “C’mon, that’s not the weirdest thing that goes through the mail,” Mayer says. After the pet is identified, Poo Prints shares the identity with property managers, who handle violators as they see fit, Mayer says. Currently, hundreds of complexes in 30 states and two other countries use Poo Prints’ services. Poo Prints hopes to enter the Nashville market soon, Mayer says. Customers can use the company with a degree of Tennessee pride. Former Gov. Don Sundquist joined the board of parent company BioPet Labs last year.